To Cite: Jonaidi Jafari N, Hosseinpour Azari A, Beykpoor M, Izadi M, Salehi E, et al. 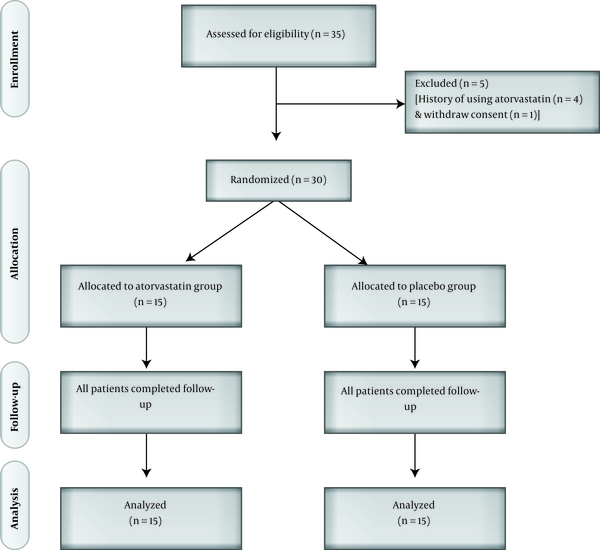 Short-term Atorvastatin Administration and Efficacy of Hepatitis B Vaccination: A Randomized, Double-blind, Placebo-Controlled Clinical Trial, Hepat Mon. 2018 ; 18(7):e14562. doi: 10.5812/hepatmon.14562. Background: It is estimated that 10% of people receiving hepatitis B (HB) vaccination fail to produce a protective level of hepatitis B surface antibody (HBsAb). Various methods such as administration of immune-enhancing medications, increasing the dose of vaccine, or changing injection route are implemented to overcome this issue. Objectives: In this regard, to the current study aimed at assessing the efficacy of atorvastatin treatment in subjects not responding to HB vaccination and evaluating the possible molecular pathways included in the process. Methods: In the current clinical trial, healthy subjects with HBsAb titers of less than 10 IU/mL after a complete course of HB vaccination were included. Participants were randomly assigned into two groups of case and control. Subjects in the case group received daily atorvastatin (40 mg) tablets for 10 days, while the controls were given identical placebo tablets. On the 5th day all subjects received 1.0 mL intramuscular HB vaccine. Four to eight weeks after vaccination, blood samples were drawn from the participants for laboratory assessments including enzyme-linked immunosorbent assay (ELISA) to measure the level of HBsAb, interleukin (IL)-4, IL-17, interferon (IFN)-γ and transforming growth factor (TGF)-β cytokines, and real-time polymerase chain reaction (PCR) was also used to evaluate the expression of their corresponding genes; T-Bet, RORc, and GATA3. Results: A total of 30 subjects (five females and 25 males) were included, with 15 participants in each group. There was no significant difference between the two groups considering baseline characteristics of the participants. Final laboratory assessment of HBsAb levels revealed that 12 (80%) subjects from the case and 5 (33.3%) from the control groups produced a protective level of antibodies (P = 0.025). No significant difference was observed in the concentration of IL-4, IL-17, IFN-γ, and TGF-β, and the expression of their corresponding genes between the two groups. Conclusions: The study showed that short-term atorvastatin administration was associated with an increased level of HBsAb to that of protective levels against HB, but this response was not induced through the assessed immune pathways. Further investigations are required to identify the exact mechanism for this effect of atorvastatin. Prevention against infection with hepatitis B virus (HBV) is an important challenging issue in every population, particularly in the developing countries. There are more than 350 million HBV carriers throughout the world (1) and it is estimated that as many as 40% of such people expire due to chronic liver disease, liver cirrhosis or primary hepatocellular carcinoma (2). Although considerable improvements are made in antiviral medications against HBV, still prevention through vaccination is the best measure against spreading the disease (3). Immune response to vaccination is affected by various factors such as age at which the vaccine is injected, the site of injection, and the number of injected doses. Data shows that three dose vaccination protocol, elicit protective antibody titers (~10 mIU/mL of antibody to hepatitis B surface antigen (HBsAg) in 90% of healthy subjects (4). Hence, approximately 10% of healthy people vaccinated against HBV are estimated to fail in producing a protective level of hepatitis B surface antibody (HBsAb) (3). Accordingly, various methods are implemented to improve immune response in this population such as administration of immune-enhancing medications, increasing the dose of vaccine, changing injection route, etc. (5-8). Statins or 3-hydroxy-3-methylglutaryl coenzyme A (HMG-CoA) reductase inhibitors that are well known for their cholesterol reduction effects elicit anti-inflammatory effects as well (9). Statins directly inhibit induction of MHC (major histocompatibility complex) class II expression by IFN-γ and thus repress MHC-II-mediated T-cell activation (10). Atorvastatin also inhibits secretion of T helper-1 (Th1) cytokines (interleukin (IL)-2, IL-12) and tumor necrosis factor (TNF-α) and stimulates differentiation of Th0 cells into Th2 cells. Antigen-specific T-cell activation induced by atorvastatin on antigen presenting cells (APC) and T-cells, known as pleiotropic immunomodulatory effects, should be considered for the treatment of either APC or T-cell suppression (11). Short-term atorvastatin treatment enhances specific antibody production in healthy patients following tetanus toxoid vaccination (12). Considering the possible effects of atorvastatin on further activation of immune system, the current study aimed at evaluating the efficacy and immunogenicity of this drug on subjects not responding to HB vaccination in a prospective randomized trial. The current study also assessed possible immunologic pathways through which this drug might be affecting the immune system by measuring the levels of IL-4, IL-17, interferon (IFN)-γ, and transforming growth factor (TGF)-β cytokines and expression of their corresponding genes including T-Bet, RORc, and GATA3. The current study was conducted as a randomized, double-blind, placebo-controlled trial from 2011 to 2012 in Baqiyatallah University of Medical Sciences, Tehran, Iran to determine the immune response effects of short-term atorvastatin administration together with HBV vaccination among non-responder participants. Unfortunately, this number could not be achieved during the recruitment period. Therefore, it was tried to compensate for the small sample population by performing bootstrap in the analyses. Using a convenience sampling method, the study enrolled healthy subjects aged ≥ 18 years who were non-responder to HBV vaccination; that is the ones with anti-HBs titer < 10 mIU/mL two months after receiving the last dose of primary HBV vaccination. The minimum age of 18 years was determined, according to previous studies (12, 14), in order to make sure that the subjects completed their vaccination series and were true non-responders. Participants with a positive test result for serum markers of HBsAg, HBcAb, or HBsAb in the primary evaluations indicating prior or current HBV infection, subjects with chronic liver diseases, underlying diseases affecting the immune system such as HIV, or with a history of taking atorvastatin or immunosuppressive agents such as corticosteroids or methotrexate prior to enrollment were excluded. A statistician completely independent of the process of data management and analysis created random sequence generation using a random number table and all participants and investigators were masked to the treatment allocation. Therefore, the participants were randomly assigned in a 1:1 ratio to receive daily dose of either 40 mg atorvastatin (n = 15) or placebo (n = 15) for a 10-day intervention course. Figure 1 shows the flowchart of the study. Both placebo and atorvastatin were manufactured by Razak Company, Karaj, Iran and had no difference regarding shape, preservative materials, and color except for the active substance of atorvastatin. Considering the pharmacokinetics of atorvastatin and the half-life of HMG-CoA reductase in the body, to make sure that the drug reached a stable serum concentration, HBV vaccine (20 µg/mL) was administered on the 5th day of intervention course, intramuscularly into the deltoid muscle of participants’ left arm using a 20-gauge needle. All vaccines were genetically engineered recombinant hepatitis B (Engerix-B), manufactured by GlaxoSmithKline Biologicals (GSK) in Belgium. They were stored at 2-8°C and maintained within the cold chain through the transportation process. Eight weeks after vaccination, 10 mL of blood was collected from each participant, heparinized and sent to a laboratory to assess the level of HBsAg, hepatitis B core antibody HBcAb, hepatitis B surface antibody HBsAb, IL-4,ww IL-17, (IFN)-γ, and TGF-β using the enzyme-linked immunosorbent assay (ELISA) and expression of T-Bet, RORc, and GATA3 genes using the real-time polymerase chain reaction (PCR). Ficoll gradient centrifugation (Pharmacia, Uppsala, Sweden) was used to separate Peripheral Blood Mononuclear Cells (PBMCs) from the heparinized peripheral blood. Isolated PBMCs were washed in RPMI-1640 medium (Gibco Life Technologies Ltd., Paisley, UK), and then suspended again in the complete culture medium containing RPMI-1640, 10% heat-inactivated fetal bovine serum (Gibco, Grand Island, NY, USA) and antibiotics including streptomycin (100 µg/mL) and penicillin (100 U/mL) (Biosera, Ringmer, East Sussex, UK). In the presence of 1 µg/mL anti-CD-28 (Sigma-Aldrich Corporation, St Louis, MO, USA) and 10µg/mL of purified surface antigen of recombinant HBV without any additives (Heberbiotec Co. Cuba), 2 × 106 cell/mL PBMC was seeded in a 24-well sterile culture plate (Nalge Nunc International, Roskilde, Denmark). After 72 hours of incubation at 37°C in humidity plus 5% CO2, culture supernatants were collected and stored at -80°C until used. Commercial ELISA kits were used to detect HBsAb (Enzygnost Micro, Boehringer, Germany), HBcAb, and HBsAg (Organon Teknika, The Netherlands). Quantification of HBsAb titer was done by extrapolation from a standard curve constructed using a serum sample provided by the manufacturer with a specific antibody concentration. Sandwich ELISA was used to measure all of the IL-4, IL-17, IFN-γ, and TGF-β via commercial kits (Biosource International, Camarillo, CA, USA). The assay was optimized for IL-4 according to the manufacturer recommendations by titration of the paired detection and capture antibodies to identify the optimum concentration of both antibodies. In this regard, capture antibodies (1 µg/mL) were coated in polystyrene ELISA plates (Maxisorp, Nunc) and the detection antibodies (biotinylated, 0.4 µg/mL) were used to detect antibodies against this cytokine. Following the manufacturer’s instructions, total RNA was isolated from PBMCs (Ribospin, GeneALL, Seoul, Korea). Spectrophotometry was used to monitor RNA concentrations (NanoDrop, Thermo Scientific, Wilmington, DE, USA) and the extracted RNA was assessed for its integrity using gel electrophoresis for the intact 28S and 18S ribosomal RNA. With a first strand complementary DNA (cDNA) synthesis kit (Fermentas, Germany), cDNA was derived from the RNA and stored at -20°C until used. All PCR amplifications were performed using SYBR Green System (PrimerDesign, Southampton, UK) and assays were conducted in a thermal cycler (RotorGene 6000, Corbett Life Science, Australia). Specific primers for T-bet, GATA3, and RORc as well as β-actin, as the housekeeping gene to normalize mRNA expression levels between different samples were purchased (TAG, Copenhagen, Denmark). The cDNA, synthesized according to the target RNAs using reverse transcriptase enzyme, went through the stages of heating for denaturation and re-synthesis over and over again. After each cycle, the number of genes multiplied and the fluorescent signal received by the device increased. The higher initial number of copies in the sample needed less cycles for its signal intensity to surpass the pre-determined level. For each cDNA, the needed number of cycles was measured and reported as the cycle threshold value (Ct value). The results were also reported as Delta Ct, calculated as the Ct value of the target gene minus the Ct value of β-actin gene. The current study was conducted in accordance with the good clinical practice guidelines and the ethical standards of Helsinki declaration. After approval by Institutional Ethics Committee of Baqiyatallah University, the study was registered at the Iranian Registry of clinical trials (code: IRCT201109147556N1) and the USA (NCT01548326). All participants signed informed consent forms before enrollment and they were free to withdraw from the study any time. Quantitative and qualitative variables were expressed as mean ± standard deviation (SD) and frequency (percentage), respectively. Chi-square test was used to compare qualitative variables and Student t test to analyze quantitative variables between the study groups. A P-value < 0.05 was considered as statistically significant and SPSS software, version 20.0 (SPSS Inc., Chicago, IL, USA) was employed to perform all statistical analyses in the current project. A total of 30 subjects including 25 males (83.3%) and 5 females (16.7%) with the mean age of 29.93 ± 9.41 years were included in the study. General characteristics of the study population are presented in Table 1. As can be observed, there were no significant differences between the participants of the two groups regarding age, gender, body mass index (BMI), cigarette smoking, and primary HBsAb titer, which indicated a successful randomization. Abbreviations: BMI, body-mass index; HBs Ab, hepatitis b surface antibody. Table 2 presents the seroprotection rate of HBsAb, concentration of measured cytokines, and Ct values for GATA3, T-Bet, RORc, and β-actin at the follow-up time. Delta Ct values are also presented for the three GATA3, T-Bet, and RORc genes, which are normalized Ct values according to that of β-actin’s as the housekeeping gene. As can be observed, HBsAb titers were higher in the atorvastatin group compared with the placebo group, but the differences were not statistically significant; however, the qualitative assessment of seroprotection with a threshold of HBsAb > 10 mIU/mL revealed a significantly higher rate in the case group compared with the control group (80.0% vs. 33.3%; P = 0.025; RR = 2.4, 95% confidence interval (CI): 1.12 - 5.13). On the other hand, the differences in the mean concentrations of the four cytokines, the mean Ct values of the three evaluated genes, and their delta Ct values between the two groups were all insignificant. Abbreviations: HBs Ab, hepatitis b surface antibody; Ct, cycle threshold. To make a qualitative comparison between the two groups, considering the Ct values of evaluated genes, Ct values less than 29 were considered as abundant presence of the target nucleic acid, Ct values 30 - 37 were considered as moderate presence of the target nucleic acid, and Ct values greater than 38 were considered as minimal presence. The results of this comparison are presented in Table 3, which shows that the qualitative comparisons also yielded no significant difference between the two groups. Univariate analyses were performed to evaluate the relationship between induced immunity in the subjects with their general characteristics, the concentration of assessed cytokines and expression of target genes. There were no significant relationships between any of these evaluated variables and the level of produced antibodies to induce immunity. Hence, the only factor that was associated with protective antibody levels was short term atorvastatin treatment with a relative risk of 2.4 (95% CI: 1.12 - 5.13). Since univariate analysis did not reveal any possible confounding factor, there was no need to perform further multivariate analysis on the data. The effects of short-term atorvastatin treatment on efficacy of HB vaccination in non-responder subjects were assessed in the current study, and the possible molecular pathways in this process were investigated. The main indication for administration of statins was high serum cholesterol levels and the drug reduced cardiovascular events and mortality in this setting (15, 16). Recent studies show that statins can also interfere with Th1/Th2 balance as well as MHC class II expression, which can lead to changes in immune responsiveness (11, 17-19). In this regard, many studies evaluated the effects of this drug on various immunologic-related conditions such as rheumatologic diseases (20-23), response to different vaccines (12, 14, 24), central nervous system autoimmune diseases (25-27), and chronic obstructive pulmonary disease (28). Based on the promising results reported by the available literature, the current study aimed at assessing the effects of atorvastatin on immune response to HB vaccine in subjects with insufficient antibody titers. Although there were no studies exactly similar to the current study to compare the results with, the current study findings were quite compatible with a previous study focusing on tetanus vaccinations (12). In their randomized, placebo-controlled trial, Lee et al., included 20 healthy subjects and assigned them to a 10-day treatment with either atorvastatin or placebo with a tetanus toxoid (TT) booster on the 5th day. They observed a three-fold higher production of anti-TT antibodies in the atorvastatin group compared with the placebo group, 15 days after vaccination. Further assessments showed that the antibodies were predominantly IgG1, while the level of other IgG subclasses did not go through a significant change. Post-vaccination rise in lymphocyte and platelet counts was also suppressed by the drug (12). Although in the current study the increase in antibody titers was not significantly different between the two groups, a significantly higher rate of protective antibody levels were observed in subjects treated with atorvastatin; and based on the calculated relative risk, it could be stated that the chance of obtaining a protective antibody level was 2.4 times higher in participants taking atorvastatin than the subjects treated with placebo. On the contrary, in another study conducted by Packard et al., the effects of short-term atorvastatin treatment were evaluated on 150 healthy subjects receiving one dose of hepatitis A vaccine and immune response was assessed one-month post-vaccination. These researchers did not find any significant difference in the level of antibodies between the case and control groups and reported no positive or negative effects exerted from atorvastatin treatment (14). Major aspects of this study differed from those of the current study that might have led to the different outcomes: First, Packard et al., included healthy subjects that had not received hepatitis A vaccine before participation in the study, while the current study included subjects who had not responded to the routine three dose HB vaccination and were considered as non-responders. Second, they started statin treatment on the same day of vaccination; hence, the drug may not have had sufficient time to exert its immunomodulatory actions during antibody production processes. Overall, multiple immune cell classes cooperate to induce an immune response against a foreign antigen. This virus can be an intra- or extra-cellular pathogen or similar to that of the current study can be injected into the body through vaccination. When activated by the cytokines, B-lymphocytes transform into memory B-cells or plasma cells. Most antigens activate these B-lymphocytes through stimulation of various Th cells (29). Th1 cells are one of these cells in which T-bet gene encodes the T-box 21 master transcription factor that controls production of IFN-γ pro-inflammatory cytokine and plays an important role in differentiation of T-lymphocytes (30, 31). The released IFN-γ activates macrophages and production of opsonization antibodies in B-lymphocytes. These cells typically induce a cell-mediated immune response against intra-cellular pathogens (29, 32). In another pathway, GATA3 gene encodes a T-cell specific transcription factor known as GATA binding protein 3, which stimulates Th2 cells to release IL-4, IL-5, and IL-13 and also inhibits differentiation of T-cells into Th1 cells (33). The release of these cytokines stimulates B-lymphocytes to produce neutralizing antibodies. These cells induce an immune response mostly against extra-cellular organisms and mediate eosinophil inflammation and allergic responses. TGF-β and IL-6, secreted from T regulatory cells, stimulate T-cells to differentiate into Th17 cells responsible for producing IL-17. This cytokine is a pro-inflammatory factor and plays an important role in inter-cellular signaling systems (34). Inside these cells, RAR-related orphan receptor (RORc) encodes two isoforms of RORγt and RORγ, transcription factors that attach to the DNA and stimulate differentiation of thymocytes into Th17 cells (35). Th17 cells activate mostly neutrophils and to some extent the B-lymphocytes. Considering these pathways and to determine how the balance of Th cells shift in atorvastatin-induced immune response after vaccination, the current study measured the concentration of IL-4, IL-17, IFN-γ, and TGF-β cytokines and expression of their corresponding T-Bet, RORc and GATA3 genes in healthy non-responders to HB vaccine. But, the results showed no significant differences in these parameters between the two study groups. These findings were compatible with those of the study conducted by Lee et al., in which the researchers evaluated the effects of atorvastatin on the acute phase response after vaccination by measuring the levels of ESR, CRP, α1-antitrypsin, α1-acid glycoprotein along with Th1 (IFN-γ) and Th2 (IL-4, IL-6, IL-10) cytokines and found no significant differences between the two groups regarding the serum concentration of these cytokines and acute phase parameters (12). The current study further assessed all the possible factors that might affect reaching a protective HBsAb level in the subject and found that only the study group had a significant correlation with a sufficient immune response in the subjects, which confirmed the significant effect of atorvastatin treatment in reaching protective antibody levels. On the other hand, the findings of the current study showed that none of the assessed immune pathways were responsible for this effect. Therefore, further investigations are required to find the molecular mechanisms through which atorvastatin induces immune response in subjects not responding to HB vaccination. The current study had multiple limitations that should be addressed. First and most importantly, limited financial resources precluded the study from measuring the levels of evaluated cytokines and expression of their corresponding genes at baseline, before atorvastatin treatment. Such measures could provide higher valued information regarding the changes of these parameters after intervention. The current study could also measure the levels of serum cholesterols to have an objective mean to show that the patients took their tablets as instructed. Moreover, following up the participants for a longer period of time and measuring HBsAb levels in different time points could show the trend of changes and the long-term effects of atorvastatin on producing protective antibody levels. Accordingly, it is recommended that these limitations be considered in future studies on this subject. It seems that short-term atorvastatin treatment can lead to changes in immune response towards reaching protective antibody levels against HB after vaccination in non-responders, but the immune response induced by this drug was not stimulated through the pathways including IL-4, IL-17, IFN-γ, and TGF-β cytokines and expression of their corresponding T-Bet, RORc, and GATA3 genes. The current study received a grant from Baqiyatallah University of Medical Sciences, Tehran, Iran and the laboratory evaluations were performed by the Department of Immunology at Tehran University of Medical Sciences, Tehran, Iran. Authors would like to thank all the laboratory personnel and all the participants who kindly cooperated with the researchers in all the steps of the current survey. Authors’ Contributions: Study concept and design: Jafari Jonaidi, Hosseinpour Azari, Beykpoor, Izadi, Salehi, and Alavian; acquisition of data: Jafari Jonaidi, Salehi, and Safiabadi; analysis and interpretation of data: Beykpoor and Hosseini; drafting of the manuscript: Jafari Jonaidi, Beykpoor, Nikoueinejad, Hosseini, and Safiabadi; critical revision of the manuscript for important intellectual content: Jafari Jonaidi, Hosseinpour Azari, Izadi, Nikoueinejad, and Alavian; statistical analysis: Beykpoor and Hosseini; administrative, technical, and material support: Jafari Jonaidi, Izadi, Salehi, and Alavian; study supervision: Jafari Jonaidi, Izadi, and Alavian. Funding/ Support: Baqiyatallah University of Medical Sciences financially supported the project. Financial Disclosure: All the authors declare no conflict of interests. 1. Wang T. Model of life expectancy of chronic hepatitis B carriers in an endemic region. J Epidemiol. 2009;19(6):311-8. [PubMed: 19801886]. [PubMed Central: PMC3924100]. 2. Trepo C, Chan HL, Lok A. Hepatitis B virus infection. Lancet. 2014;384(9959):2053-63. 3. Bertino JJ, Tirrell P, Greenberg RN, Keyserling HL, Poland GA, Gump D, et al. A comparative trial of standard or high-dose S subunit recombinant hepatitis B vaccine versus a vaccine containing S subunit, pre-S1, and pre-S2 particles for revaccination of healthy adult nonresponders. J Infect Dis. 1997;175(3):678-81. [PubMed: 9041342]. 4. Roome AJ, Walsh SJ, Cartter ML, Hadler JL. Hepatitis B vaccine responsiveness in Connecticut public safety personnel. JAMA. 1993;270(24):2931-4. [PubMed: 8254852]. 5. Hollinger FB. Factors influencing the immune response to hepatitis B vaccine, booster dose guidelines, and vaccine protocol recommendations. Am J Med. 1989;87(3):S36-40. 6. Filippelli M, Lionetti E, Gennaro A, Lanzafame A, Arrigo T, Salpietro C, et al. Hepatitis B vaccine by intradermal route in non responder patients: an update. World J Gastroenterol. 2014;20(30):10383-94. doi: 10.3748/wjg.v20.i30.10383. [PubMed: 25132754]. [PubMed Central: PMC4130845]. 7. Zaffina S, Marcellini V, Santoro AP, Scarsella M, Camisa V, Vinci MR, et al. Repeated vaccinations do not improve specific immune defenses against Hepatitis B in non-responder health care workers. Vaccine. 2014;32(51):6902-10. doi: 10.1016/j.vaccine.2014.10.066. [PubMed: 25444815]. 8. Shouval D, Roggendorf H, Roggendorf M. Enhanced immune response to hepatitis B vaccination through immunization with a Pre-S1/Pre-S2/S vaccine. Med Microbiol Immunol. 2015;204(1):57-68. doi: 10.1007/s00430-014-0374-x. [PubMed: 25557605]. [PubMed Central: PMC4305084]. 9. Wong B, Lumma WC, Smith AM, Sisko JT, Wright SD, Cai TQ. Statins suppress THP-1 cell migration and secretion of matrix metalloproteinase 9 by inhibiting geranylgeranylation. J Leukoc Biol. 2001;69(6):959-62. [PubMed: 11404382]. 10. Kwak B, Mulhaupt F, Myit S, Mach F. Statins as a newly recognized type of immunomodulator. Nat Med. 2000;6(12):1399-402. doi: 10.1038/82219. [PubMed: 11100127]. 11. Youssef S, Stuve O, Patarroyo JC, Ruiz PJ, Radosevich JL, Hur EM, et al. The HMG-CoA reductase inhibitor, atorvastatin, promotes a Th2 bias and reverses paralysis in central nervous system autoimmune disease. Nature. 2002;420(6911):78-84. doi: 10.1038/nature01158. [PubMed: 12422218]. 12. Lee PY, Scumpia PO, Byars JA, Kelly KM, Zhuang H, Shuster JS, et al. Short-term atorvastatin treatment enhances specific antibody production following tetanus toxoid vaccination in healthy volunteers. Vaccine. 2006;24(19):4035-40. doi: 10.1016/j.vaccine.2005.12.042. [PubMed: 16464519]. 13. Cohen J. Statistical power analysis for the behavioral sciences (revised ed). New York: Academic Press; 1977. 14. Packard RR, Schlegel S, Senouf D, Burger F, Sigaud P, Perneger T, et al. Atorvastatin treatment and vaccination efficacy. J Clin Pharmacol. 2007;47(8):1022-7. doi: 10.1177/0091270007302169. [PubMed: 17548534]. 15. LaRosa JC, He J, Vupputuri S. Effect of statins on risk of coronary disease: a meta-analysis of randomized controlled trials. JAMA. 1999;282(24):2340-6. [PubMed: 10612322]. 16. Cheung BM, Lauder IJ, Lau CP, Kumana CR. Meta-analysis of large randomized controlled trials to evaluate the impact of statins on cardiovascular outcomes. Br J Clin Pharmacol. 2004;57(5):640-51. doi: 10.1111/j.1365-2125.2003.02060.x. [PubMed: 15089818]. [PubMed Central: PMC1884492]. 17. Hakamada-Taguchi R, Uehara Y, Kuribayashi K, Numabe A, Saito K, Negoro H, et al. Inhibition of hydroxymethylglutaryl-coenzyme a reductase reduces Th1 development and promotes Th2 development. Circ Res. 2003;93(10):948-56. doi: 10.1161/01.RES.0000101298.76864.14. [PubMed: 14563711]. 18. Aktas O, Waiczies S, Smorodchenko A, Dorr J, Seeger B, Prozorovski T, et al. Treatment of relapsing paralysis in experimental encephalomyelitis by targeting Th1 cells through atorvastatin. J Exp Med. 2003;197(6):725-33. doi: 10.1084/jem.20021425. [PubMed: 12629065]. [PubMed Central: PMC2193848]. 19. Weitz-Schmidt G. Statins as anti-inflammatory agents. Trend Pharmacol Sci. 2002;23(10):482-7. 20. Ferreira GA, Navarro TP, Telles RW, Andrade LE, Sato EI. Atorvastatin therapy improves endothelial-dependent vasodilation in patients with systemic lupus erythematosus: an 8 weeks controlled trial. Rheumatology (Oxford). 2007;46(10):1560-5. doi: 10.1093/rheumatology/kem186. [PubMed: 17693444]. 21. Charles-Schoeman C, Khanna D, Furst DE, McMahon M, Reddy ST, Fogelman AM, et al. Effects of high-dose atorvastatin on antiinflammatory properties of high density lipoprotein in patients with rheumatoid arthritis: a pilot study. J Rheumatol. 2007;34(7):1459-64. [PubMed: 17552046]. 22. El-Barbary AM, Hussein MS, Rageh EM, Hamouda HE, Wagih AA, Ismail RG. Effect of atorvastatin on inflammation and modification of vascular risk factors in rheumatoid arthritis. J Rheumatol. 2011;38(2):229-35. doi: 10.3899/jrheum.100582. [PubMed: 21041278]. 23. McInnes IB, Kim HY, Lee SH, Mandel D, Song YW, Connell CA, et al. Open-label tofacitinib and double-blind atorvastatin in rheumatoid arthritis patients: a randomised study. Ann Rheum Dis. 2014;73(1):124-31. doi: 10.1136/annrheumdis-2012-202442. [PubMed: 23482473]. 24. Omer SB, Phadke VK, Bednarczyk RA, Chamberlain AT, Brosseau JL, Orenstein WA. Impact of Statins on Influenza Vaccine Effectiveness Against Medically Attended Acute Respiratory Illness. J Infect Dis. 2016;213(8):1216-23. doi: 10.1093/infdis/jiv457. [PubMed: 26516141]. [PubMed Central: PMC4799662]. 25. Weber MS, Prod'homme T, Youssef S, Dunn SE, Steinman L, Zamvil SS. Neither T-helper type 2 nor Foxp3+ regulatory T cells are necessary for therapeutic benefit of atorvastatin in treatment of central nervous system autoimmunity. J Neuroinflammation. 2014;11:29. doi: 10.1186/1742-2094-11-29. [PubMed: 24498870]. [PubMed Central: PMC3922392]. 26. Li XL, Zhang ZC, Zhang B, Jiang H, Yu CM, Zhang WJ, et al. Atorvastatin calcium in combination with methylprednisolone for the treatment of multiple sclerosis relapse. Int Immunopharmacol. 2014;23(2):546-9. [PubMed: 25448497]. 27. Ghasami K, Faraji F, Fazeli M, Ghazavi A, Mosayebi G. Interferon beta-1a and Atorvastatin in the Treatment of Multiple Sclerosis. Iran J Immunol. 2016;13(1):16-26. [PubMed: 27026043]. 28. Mroz RM, Lisowski P, Tycinska A, Bierla J, Trzeciak PZ, Minarowski L, et al. Anti-inflammatory effects of atorvastatin treatment in chronic obstructive pulmonary disease. A controlled pilot study. J Physiol Pharmacol. 2015;66(1):111-28. [PubMed: 25716971]. 29. Doan T, Melvold R, Viselli S, Valtenbaugh C. Immunology: Wolters Kluwer Health. 2012. 30. Mak TW, Saunders ME, Jett BD. Primer to the Immune Response. Elsevier Science; 2013. 31. Yu SF, Zhang YN, Yang BY, Wu CY. Human memory, but not naive, CD4+ T cells expressing transcription factor T-bet might drive rapid cytokine production. J Biol Chem. 2014;289(51):35561-9. doi: 10.1074/jbc.M114.608745. [PubMed: 25378399]. [PubMed Central: PMC4271239]. 32. Abbas AK, Lichtman AHH, Pillai S. Basic Immunology: Functions and Disorders of the Immune System. Elsevier Health Sciences; 2012. 33. Yagi R, Zhu J, Paul WE. An updated view on transcription factor GATA3-mediated regulation of Th1 and Th2 cell differentiation. Int Immunol. 2011;23(7):415-20. doi: 10.1093/intimm/dxr029. [PubMed: 21632975]. [PubMed Central: PMC3123974]. 34. Aggarwal S, Gurney AL. IL-17: prototype member of an emerging cytokine family. J Leukoc Biol. 2002;71(1):1-8. [PubMed: 11781375]. 35. Ivanov ,I, McKenzie BS, Zhou L, Tadokoro CE, Lepelley A, Lafaille JJ, et al. The orphan nuclear receptor RORgammat directs the differentiation program of proinflammatory IL-17+ T helper cells. Cell. 2006;126(6):1121-33. doi: 10.1016/j.cell.2006.07.035. [PubMed: 16990136].